HomeHeadphone ComparisonsATH M50 vs. HD 598 | BIG DIFFERENCES! Before we get into the ATH M50 vs. HD 598, grab a snack, sit back and relax because..
Great sound-stage for a closed back model What is Soundstage? This is a luscious set of headphones to be quite honest. The ivory and maroon is unique and adds a nice overall touch to the look and feel of these babies. What you get from them first and foremost is neutrality. They are an honest set of cans, and will not color your sound source in any way. They also provide exceptional clarity, sound-stage, and are extremely durable and comfy. The velour ear pads are pretty much a staple in great headphones these days. They are raved about in nearly every review as being some of the most comfortable cans you can buy. If you are looking for a predictable and even sound, and want longevity out of your purchase, you may want to consider the HD 598’s.. They are open backed, and do well in an isolated studio environment, absent of any extraneous noise and distraction. Please don’t buy these and expect them to be noise cancelling. They ARE NOT. 🙂 They do leak sound, so be aware of that. Remarkable reproduction of sound at it’s most natural and transparent state. So comfy that you forget you’re wearing them. Durable, and not prone to breaking down. Cable is a bit long for some peoples taste. This can be remedied by buying a shorter one. If you don’t want to buy a shorter one, just use the twist tie that the original comes with. At 50 Ohms, these don’t necessarily require an amp, but do benefit from one as mentioned above. Reviewers rave about every aspect of these beasts. From their uncolored, natural sound, to the unbelievable comfort, to pure aesthetic. The sound-stage they provide is nothing short of sensational, and as an open backed model you will be able to immerse yourself in the music, literally. It feels like you are there.. Just be aware that pairing these with an amp will bring out their full potential. Both have a very nice build quality, and excel in the longevity department. Both have similar impedance, and can be plugged into any mobile device and sound great! The HD 598’s have a unique blend of colors while the M50’s go for the traditional black and silver. The M50’s stand apart from many headphones in that they contort and fold in a myriad of different ways. The HD 598’s by contrast are a bit more limited in that regard. Perhaps the most important difference between the two. The HD 598’s are a mixing/reference headphone that distributes the sound evenly across the spectrum. They are about as flat and neutral as it gets, but still remain a very enjoyable and eye opening listen. The M50’s have a slightly exaggerated low end, but never feel overpowering, bloated, or cheap. It’s just more pronounced. So the M50’s are a bit more “colored” if you will than the 598’s. The 598’s do well with classical, jazz, and acoustic stuff. They also excel in gaming and movies because of the subtle nuances that are heard in their sound signature. The 598’s sport that extremely comfortable velour padding that people rave about in reviews. The M50’s have a sort of “faux leather” padding which, while comfortable, is prone to breaking down and cracking over time. Both are good for mixing, but the 598’s are better suited for it because of their flat signature and open back design, which lets some sound escape. The M50’s as stated above have more of a colored sound and sport a closed back design. The sound has more of a tendency to get trapped inside of your dome. The M50’s have been accused of having a recessed mid-range, which basically means that because the low end and high end are more pronounced, the mid-range gets forgotten about and thus isn’t as recognized. By contrast, the 598’s mid-range is exceptional, and to many is the highlight of the headphone overall. The 598’s don a detachable cable, while the M50’s do not. Note however, the M50x’s do have a detachable cable. The 598’s have a remarkable sound-stage, while the M50’s do not. With the 598’s you will feel immersed in the music, as if the band is playing live in front of you. You will be able to place different musicians on stage, and really get a sense of depth and space. This is common with open back models. By contrast, the M50’s sound does get trapped inside of your head with little room to breathe. When you first put the M50’s on, you will feel as though the sound is huge. This feeling does last quite a while, and you will experience hints of sound-stage, but it fades with time. This leads into the next point. Open back vs. closed back. The M50’s are closed back, and do isolate sound from the outside. People won’t be able to hear what you are listening to, even at a pretty high volume. You also will not be able to hear what’s going on outside of the headphones. By contrast, the 598’s are open back, meaning some sound does escape, leading to a more pleasant experience overall. If the sound doesn’t have room to breathe, fatigue can set in faster. You will have to give your ears and head a rest with the M50’s. You are looking for a flat, even, neutral, and honest sound reproduction. You want a more comfortable listening experience. You want a headphone with a great mid-range and remarkable sound-stage. You listen to more classical, jazz, and acoustic. You want an immersive movie and gaming experience. You need great set of headphones for mixing/reference. CLICK HERE TO READ THE HD598 REVIEWS ON AMAZON! You want that hard hitting bass and want to be instantly rewarded with amazing sound. You need a headphone that does well on the road. The M50 is extremely durable and can take a lot of abuse. It also comes with a nice carrying case/bag. SEE THE M50’s FOR YOURSELF ON AMAZON! Well that’s about it for today my friend! I hope you have gained some insight on the M50 vs. HD 598, and which applications each are best suited for. I also hope I’ve answered all of your questions, but if not please let me know down below or Contact me! Which of these headphones would better suit your needs? What’s your favorite headphone out there? Thank you Nik! My goal here is to give as much in depth and unbiased information as possible. I hope you check out my other articles, and continue to frequent the site!! If you have any questions or requests, Contact me! Great Review! I am really pondering the choice between the M50x and the 598. My biggest worry right now that makes me want to get the M50x is sound leakage. At medium volume, would the 598 leak enough sound for the content to be discernible from a person 7 feet away? Also, is the 598 good to use on a mobile device (in this case a nexus 6p)? So do I need an amp, and will it be a problem to the health of either the headphones or the phone? Yes, if there’s one thing to take away here, it’s that the HD 598 will leak a lot of sound. People will be able to hear what you’re listening to even at mid-level volume. The 598’s do well on portable devices as well. The only caveat really is their inverted adapter. You know how most headphones terminate or end in a 3.5mm plug? They also usually come with a 1/4″ screw on adapter for use with interfaces and mixers. However, the 598 is the opposite. It terminates in a 1/4″ plug, and comes with a 3.5mm adapter! Strange huh? The point here is that with mobile devices, this mechanism becomes a little awkward and bulky. Other than that, the sound is phenomenal regardless. 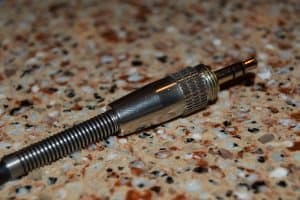 If you don’t want to even mess with the original cable, you can purchase an aftermarket replacement one that has the normal 3.5mm plug to 1/4″ adapter. As far as an amp, the 598 doesn’t need one per se, but having one does bring out the sound. A common pairing with it is the Fiio E10K. The M50’s don’t need one either. As far as health to the headphones or phone? No. Your phone and headphones will do just fine. Any other questions just ask !! Glad you stopped by..
Really excellent reviews on all the products. I am sure your experience will help out a lot of people. As I have been on both sides of the glass, I also am rewarded with some knowledge. At the beginning of the year, I purchased the HD598’s and a Fiio E06 and have been rewarded with a luxurious musical experience ever since. One thing I have noticed is that my laptop has plenty of juice to drive my headphones, but I have noticed a murkiness to the sound without the amp. I think it has to do with the crazy impedance curve the HD598’s have. Soon I will be springing for the HD600’s. I am sure I won’t be disappointed. I’ll probably have to spring for a stack to get them to a better level. I hear Marshall makes a good one Lol. Best of luck to you and thank you once again. Thanks much for dropping by and for the kind words. How do you like the E06 by the way? I also want the 600’s, but have been hesitant to bite the bullet because of price. I am also thinking about going with the Magni/Modi stack, so if you’re looking for a great combo that’s the one that I have seen the most good things about. It’s very versatile for a variety of headphones, and the great thing about the 600’s is that they aren’t really amp picky, which is nice considering the are a 300 Ohm impedance can. Check out my page on How to choose a headphone amp! I was also considering the HD 598’s as they get amazing reviews as well. I’ve been reading about them for about 7 months now. Thank you again for the nice comment brother and hope to hear from you again! Which one of these is most accurate for mixing hip-hop? I’m not talking about casual listening but mixing in a home studio? The HD 598 would be most accurate, as they are very flat and neutral sounding. The M50’s have a bit too much bass extension for strictly mixing.